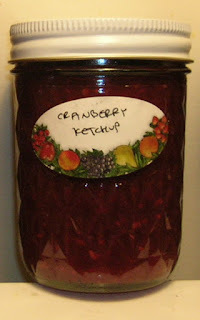 On second thought, I want to post a second cranberry recipe. This one goes well with everything so far, right now I'm baking it on top of my cranberry meatloaf from a few weeks ago that I froze half of (uncooked). It also goes great with the corndogs I posted yesterday. I am not a fan of traditional ketchup, this is more of a tangy sweet sauce, more like a nice bbq sauce. Boil cranberries with onion, garlic and water, until berries pop. Puree, add other ingredients in a large saucepan. Bring to a boil over medium-high heat, stirring, then lower heat and continue to boil gently, stirring often, about 30 minutes or until thickened. Pack in hot jars and process 15 minutes, or cut the recipe in half and just keep it all in the refridgerator. Makes about 8 8oz jars. Ooh, I love this idea! I'll have to try cranberry meatloaf. I definitely need to get my cranberry on soon--the season passes so quickly!